It’s not bragging if it comes from other sources, right? We’d like to let other people show you how effective Digital Retail Solutions is at getting the right tools into the hands of specialty retailers like you. 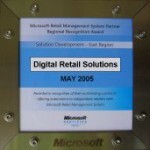 Microsoft Business Solutions likes how we operate, so they awarded us a “Spotlight” piece. Read more about us in this “Spotlight on Digital Retail Solutions” PDF. Look further down for Case Studies of our clients and testimonials. We’ve reached a higher level of Microsoft’s Partner Certification. Our expertise in POS development earned us a spot on the RMS Partner Advisory Council. We rose to the top in a very short time. We continue to excel at RMS deployment with retailers across North America. New! 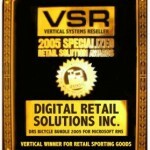 Our RMS Addins earned DRS the top Retail Vertical Developer Award, distinguish-ing DRS from among Microsoft’s best retail developers/Partners in the country. Microsoft’s retail product team honored DRS with the highest Partner award for Microsoft Retail Management System sales, service, and professional excellence. More acclaim for our RMS customizations, and the great interactivity and functionality our add-in utilities bring to retailers and their trading partners. We were singled out for recognition for our RMS customizations and enhancements. We know what our clients need to do, and we design or find customizations to meet those needs! 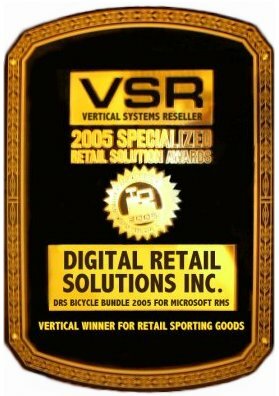 VSR Magazine recognized DRS with a win in the “Retail Sporting Goods” category of their 2005 Specialized Retail Solution Awards (November 2005). Our solution won based upon technical achievement, business problems solved, and the impact on our end-users and their consumers. Customer retention is a crucial element of your success as a retailer. Reach your customers effectively and easily with "Constant Contact" Email Marketing. Try it for FREE! © Copyright 2015 Digital Retail Solutions. All Rights Reserved.